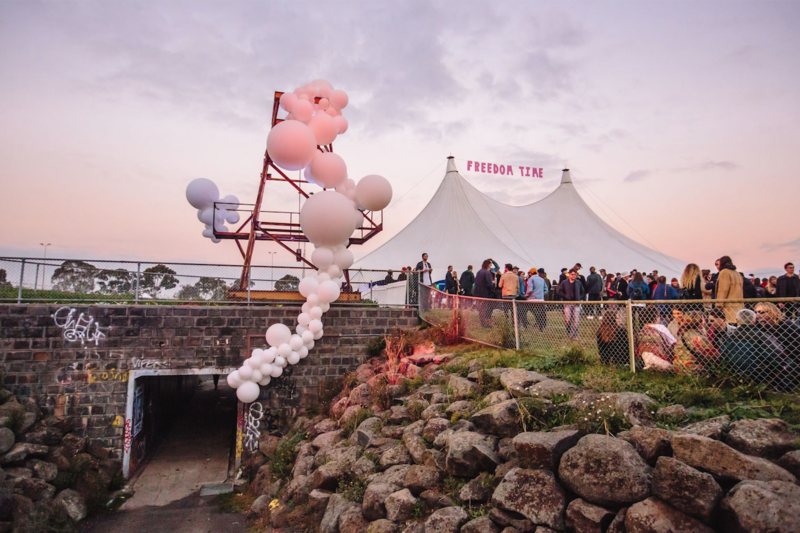 Freedom Time will reappear on the dark side of the ‘drome to present the second annual winter festival of sound and vision on Saturday 30 June 2018. Alongside three melodious institutions – Wax’o Dystopio, Butter Sessions and Music From Memory – Freedom Time has thrown the axe at the main stage ritual to present a triad of undercover music machines, each imposing their own made-to-measure realities. And with this collective force, they summon you to wander a re-imagination of Coburg Velodrome illuminated by installation and projection, plumped with cherry-picked food and beverage from the local and beyond. Bestowed upon the Wax’o Dystopian lair, the ex-Paradisians will play host to the first rave among the gum trees. Electro-specialist accomplices Dopplereffekt, and long-awaited Wave Sorceress Veronica Vasicka will headline atop the verandah, joined by homegrown residents Pjenné, Millú, Ricci and of course those Wax’o Dystopio devils themselves. Butter Sessions’ originators gift the second heavy handful of locals and internationals – Sleep D have predicted a smokey forecast with a high bunsen alert, with New York’s percussive house hard-hitter Joe Claussell on his true-blue debut, Japanese multi-monikered sound designer and producer Kuniyuki, and local dons Turner Street Sound, Cale Sexton and Lauren Hansom. Amsterdam’s aural museum Music From Memory and its forefathers Tako and Jamie Tiller co-present the third; a medley of signees and associates from all corners of the soundmosphere. Japanese pop duo Dip In The Pool and Swiss-based synth psychic Michael Turtle make their first float to Australian shores, along with Izabel the insomniac whisperer, Sui Zhen and Noise In My Head. Given that the assembly takes place in Daylight Spendings and after sundown, it’s only necessary that all the right elements are delivered through your retinas with handsome luminescence complementary to the stardrops above the Velodrome. With expertise and LED, the John Fish collective have vowed to steer every eye socket in the right direction, with more trippy-visual-transmitters to be announced. Including but not limited to La Paloma’s infamous rolls, some ripper jerk chicken and the most sonically sanctified coffee beans this city can offer (we see you, Alley Tunes), Freedom Time’s slow release food and beverage program announcements are no joke. There is no fire without fuel – dance floors require energy via nourishing ingestion.